Edited 5 time(s). Last edit at 09/13/2018 07:18PM by MSchumi24. Yes it's, hopefully 2017 will be a good year for gp4 and modders will be excited about new cars and rules in F1. Btw very nice to see you here again Enzojz! I still think GP4's physics hold up as one of the best even in competition with the recent F1 franchise. Long may the modding continue! Brings 1999 gpaedia by petrus and more fix. Track data are set by the 1999 trackpack. Because it has only 16 tracks, the gpaedia - track data display from track17 has got the trackmap and corner numbers from the original GP4. To avoid this, you have to add an empty trackmap file 25.gpi and gpi files for empty numbers into the teamart folder. I would like to release a 2.0 version of the Mod with HD textures and other small changes. As soon as I get the authorization I will release v2.0! We hope ..... thanks a lot for your work! > with HD textures and other small changes. The mod is ready but I have not yet been answered by WCP, although I have tried to contact them twice already. Can someone give me a suggestion of what to do? Where can I try to contact WCP if not on the official website? If I can not contact them, can I publish the mod? Thank you so much! I do not have Facebook and I do not want to have it, but it was important to know how to contact them on this site! WCP Series permission obtained! I thank them so much! 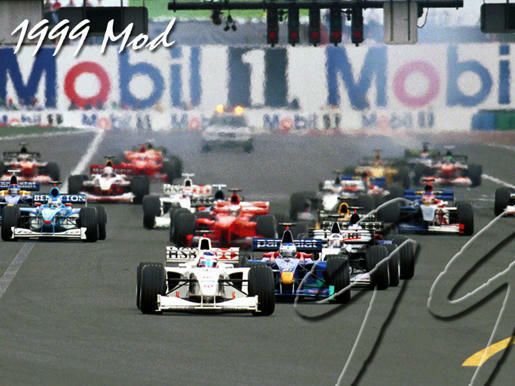 1999 Mod v2.0 will be released soon! 1999 Mod v2.0 released at 1st post! HD liveries and more! At the moment I can't download it, I'm away from home, but I would love to see some screenshots! Edited 1 time(s). Last edit at 09/13/2018 07:50PM by salvasirignano.